Not all of the Tioga Road's highlights lie within Yosemite. 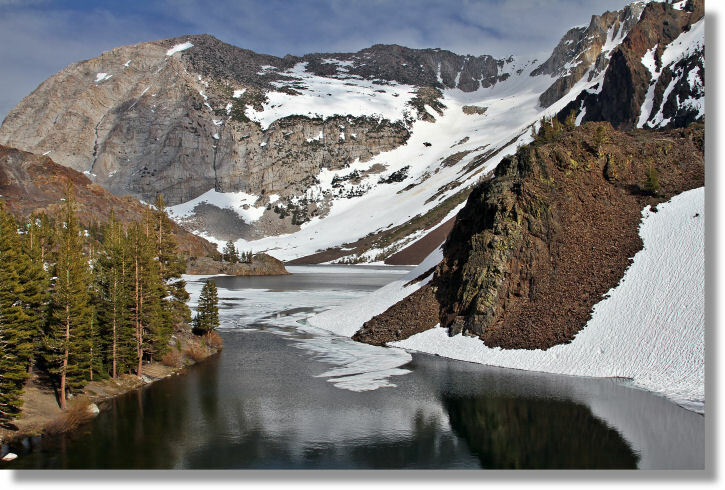 It's a memorable and dramatic ascent up Lee Vining Canyon from the sagebrush scrub of the Mono Valley to the High Sierra meadow at the park's Tioga Pass entrance, with a waterfall and two lakes for eye candy along the way. Ellery Lake, one of the high points, presents two vastly different vistas, one from the end nearest Yosemite (above, at 9,489 feet elevation) and another from the eastern end of the lake (below - also, curiously enough, at 9,489 feet). For all that these two photos seem to depict entirely different lakes, they're not only the same body of water, but they were taken within an hour of each other. There's no official trail around Ellery Lake, but hikers & fishermen are generally allowed to make their own way as long as they don't fall into the lake and drown. There's a no-reservations Forest Service campground near the northwest end of the lake. Both Tioga (just up the road from Ellery) and Ellery Lakes are manmade. It's impossible to miss Ellery Lake on the drive up the Tioga Road, but just for the sake of completeness, it's about two miles outside the Yosemite entrance - check under the red balloon on the above map. (Tioga Pass, the park entrance, is under the green tent with the little flag over it.) Tuolumne Meadows is mostly off the left edge of the map, just to the left of Lembert Dome, and Mono Lake is the big body of water at the map's northeast edge. Several other Yosemite trails traverse this map, including Gaylor Lakes (just left of Tioga Pass), Dog Lake (just north of Lembert Dome), and Mono Pass/Spillway Lake (heading south to the left of Mt. Gibbs).